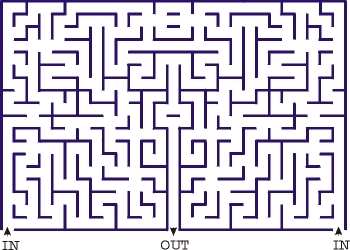 Here is a new medium sized maze with two entrances and one exit. If it is ever built it would be quite good to race each other as the left side mirrors the right hence being a mirror image maze. If you look carefully even once you get to the top you might accidently end up in the other half of the maze and you may just walk straight passed the exit route without even noticing.